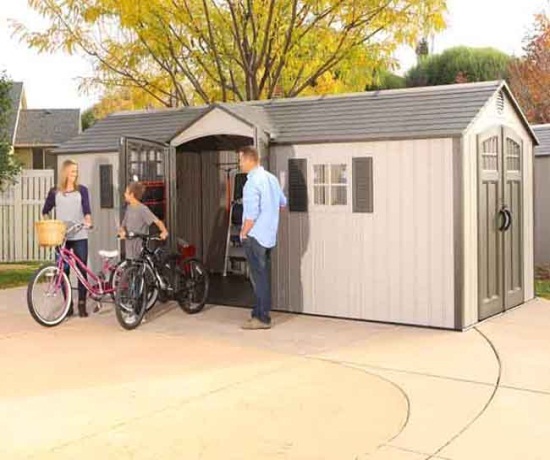 Looking for an outdoor shed that requires very low maintenance? This Lifetime 8 x 20 storage shed is constructed of high-density, steel-reinforced double-walled polyethylene plastic which is UV protected against fading. No painting required to look as good as new for many years. Doesn't split or warp like wooden sheds, or dent and rust like metal sheds. 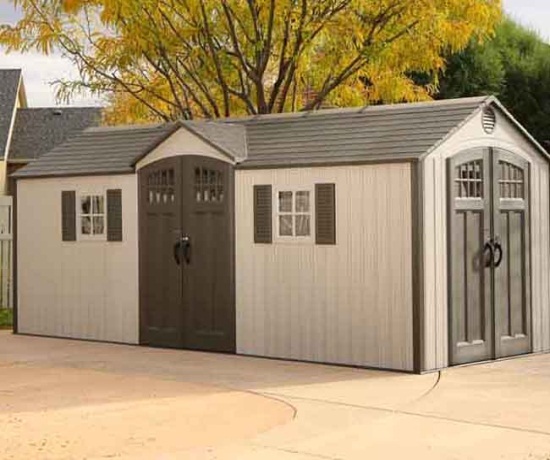 Simulated wood shingled roof and wood-grain textured wall panels make a Lifetime outdoor storage shed an attractive addition to your backyard. 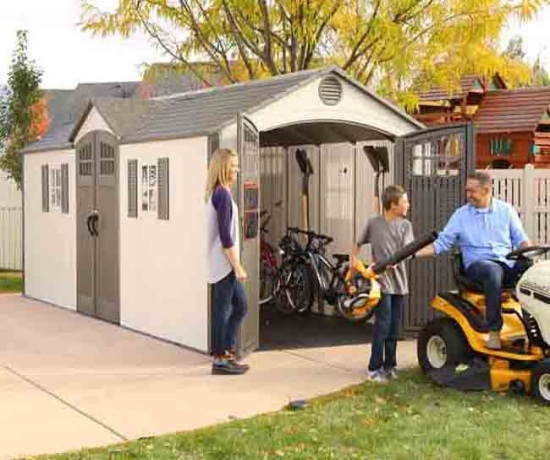 Designed with all the features that you appreciate in an outdoor shed, as well as lots of shelving and organizational accessories to keep the shed contents organized and easy to find. Made in the USA from US and imported parts. Covered by a 10 yr. limited factory warranty in US and Canada. The Lifetime 20' x 8' Dual Entry Outdoor Storage shed includes 2 large bubble skylights for plenty of light, 2 shatter-proof windows with 2 sets of shutters, and a full ridge skylight. We are including 18 tool hooks, 2 tool storage pouches, one 90" X 9" shelf and 4 corner shelves for plenty of shelf space for storage. Floor installation hardware is all included. Enjoy a lot of space for storing your landscaping equipment or any and all gardening items. High-Pitched Roof: Steep angle allows for the quick drainage of rain and snow, and provides a spacious, walk-around interior Heavy-duty steel trusses increase strength. Large Skylights: High-impact polycarbonate skylights help illuminate interior. Shatter-Proof Windows: Windows open for increased air circulation and securely lock. 56 in. x 76 in. This model is not compatible with the Lifetime Snow Load Kit or Extreme Weather Kit. This shed must be built on a flat level foundation of wood or concrete (not included). Flooring must be anchored to the foundation. Anchoring hardware depends on the type of foundation you have and is therefore not included in the shed kit. Not including the installation of the foundation, you can expect assembly of the shed itself to take 2 adults up to 8 hours.